Have I ever mentioned that I love the Wenaha? Just in case I haven’t, let me say that I love the Wenaha. For several years it has been like my second home on the weekends. It has become one of my obsessions. Each time that I visit it I leave the canyon feeling a little more whole and think to myself “I do not need to come here next weekend. I should be good for a while.” Yet, a week of work passes and I feel the Wenaha calling me to return. I floated the Wenaha twice last year (2010). The first time in an 8 foot pontoon boat from Elk Flats to Troy and the second time in a Scadden Escalade from Hoodoo to Troy. The Scadden Escalade is basically a small kayak with no floor between where your feet sit and your seat. This allows you to stand up in the middle of the kayak to go over shallow spots or stop and fish while standing in the kayak. Although I have explored Crooked Creek and the North Fork of the Wenaha, I had never went down Timothy Springs trail and followed the South Fork down. Anytime I can do two things I haven’t done before at the same time it is almost irresistible. I asked my wife if she had all the kayaks rented out from the store for the weekend and she said I could take one. I invited my good friend Trever to go since he is the one that got me interested in the Wenaha so many years ago. He didn’t think he could make it this weekend, but he offered to drop me off and help me get the kayak and gear down the first four or five miles of trail. That was certainly an offer I wasn’t going to refuse. We headed out Friday morning and took my normal route to the Wenaha and then turned off of 6413 onto 6415. This is actually the long way around or as I like to call it “The Scenic Route.” It turns into a fairly rough unmaintained road that is not real nice. But it is scenic. There are many ruts and fallen trees in the way for you to look at as you go. It at least keeps the driving interesting. (After my trip Trever told me there was a 3 foot snow drift that he barely made it through on the maintained section of road going the short way home). The trail from Timothy Springs to Milk Creek is very nice and gentle. It is well shaded and is an excellent summer hiking trail unlike the exposed, switch backing trails of Hoodoo and Cross Canyon. Although the trail was good and gentle, there were a lot of trees down and it was really nice having Trever along to help me get my kayak and gear under, over or around all the dead and fallen trees. The trees that were small enough to get off the trail we moved and a few of the bigger ones were rotten enough that we were able to break them up and clear the trail. The rest were left for the Forest Service. We reached Milk Creek and the trail seemed to get a little narrower and a bit brushier. It was fine for walking, but it became a good chore to get the kayak and gear through this section. The trail also became exposed to the sun so I was sweating profusely as I worked my way down the trail. I probably would have stopped and took a break, but each time I paused there seemed to be a mosquito waiting for me so I kept on the move. After six miles I decided the South Fork of the Wenaha was big enough to float whether it liked it or not. I shared my lunch with Trever and then he began the six mile walk back out to his pickup. My original plan was to camp on the South Fork of the Wenaha and explore it a bit more since I hadn’t spent any time on it. I switched from hiking mode to kayaking mode and headed down the South Fork. It was small, but as long as I was careful I could find a deep enough path to float through. The real problem was wood. To be more specific, large logs. 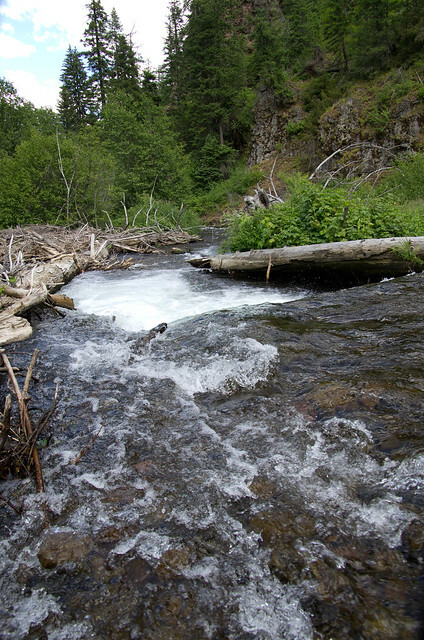 Although the South Fork of the Wenaha has enough water to float, it did not appear to have enough water to push most logs off the water in the spring. So I spent a lot of my time cussing logs and then portaging them. After a short distance I was sick of the South Fork and just wanted to get past it to where I knew there would be fewer trees on the water. I was able to make it to the bottom of the Elk Flats trail before dark and made camp at my usual spot on the South Fork above the Forks. I packed luxuriously since I wouldn’t have to hike out of the canyon and brought a book to read. The book is called The Last Indian War and covers much of the Nez Perce tribes history leading up to Chief Joseph and the Wallowa band making a run for Canada. I thought the book was suitable reading since much of the land I like to hike and explore on was once the home of the Nez Perce and Joseph Canyon itself is supposed to contain a cave that Chief Joseph was born in. 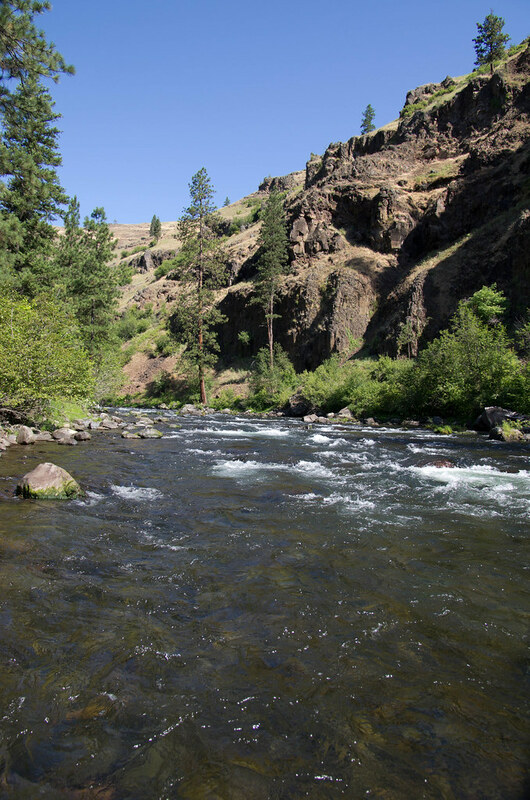 While floating the South Fork of the Wenaha, there wasn’t too many spots that made me want to stop and set up my fly rod so I decided I would spend the day fishing the familiar water of the Wenaha. The first mile below the forks is heavy pocket water with big boulders and a few slack water sections along the shore that often hold fish. Today I found no fish in this first mile. To be fair I did not fish it real hard. I made my way down to the first pool and an excellent piece of slack water just downstream that has always held many fish. I fished the pool first and found nothing and couldn’t see any big bulls sitting near the edge of the deep part or the tail out. I moved downstream to the slack water created by a small bump of bedrock. I fished downstream through the water several times and found nothing. I was beginning to think that the fish were still all further down the river system. I moved downstream a little further to see if I could spot some bulls in the water I was now not catching any fish out of. After spending a few minutes watching I spotted at least a half a dozen bulls that appeared to be sitting lazily beside the current either resting or waiting for a meal that was worthy of expending their energy. I had an olive woolly bugger and a Pat’s Rubber Legs tied in a sparkly gold and black color and I put my flies in easy striking distance of all the fish. I hate seeing big fish that don’t move to my flies, so I pulled out my fly boxes to see what looked right. My fly boxes looked pathetic. I always tie some in the summer, but I often tie a lot of flies in the winter to replenish them for the coming year. This winter I was preoccupied with my wife and I purchasing the Raft rental and shuttle business on the Grande Ronde and Wallowa and my fly boxes showed it. I had one Double Bunny left and tied it on and my old reliable nymph, the Copper John, behind it. The fish completely ignored them. 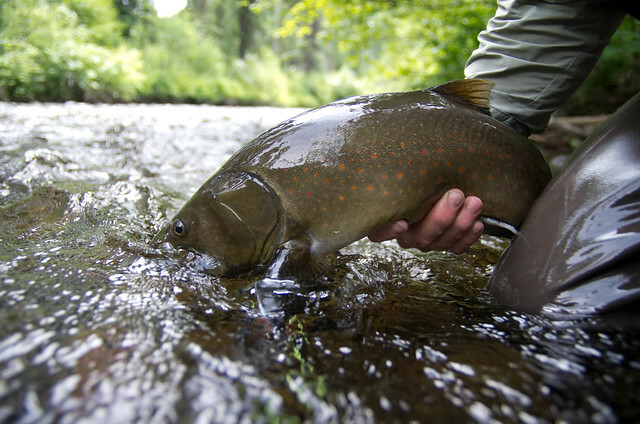 It was almost like blasphemy that Wenaha River bull trout should refuse double bunnies and copper johns and I almost moved downriver in disgust. I took one last look in my flybox. I had an old marabou streamer and my last flashback stonefly caught my eye. The marabou streamer was my first favorite streamer. It is so simple to tie and moves so seductively in the water that I never thought I would fish any other streamer. But the marabou does not hold up well and after catching a few fish half the marabou is usually gone from the fly. For this reason I have switched to rabbit hair for my streamers. But this marabou streamer was unfished, still in its prime. I tied it on and it felt good. I then looked at my last flashback stonefly and felt not so good. The only reason it was left in my fly box is because it was huge and I felt it was too big. I tied it on anyway since every form of fish on many different rivers have shown that they liked this fly by trying to eat it. I cast it upstream where a small amount of current fed into the slower water where the bulls were waiting. Almost immediately a large bull moved forward and I set the hook. It was a large fish and had enough power that I could not force it to the surface. After several runs up and down the river it got into the main current and went downstream. I followed until the bull stopped behind a rock to rest. I waded closer and reeled in line. I tried to pull the fish towards the surface and thought that I must have gotten him foul hooked on my second fly in the battle because he did not come to the surface even with some effort. I then applied more force and was a little shocked when a broad back of a hook jawed bull finally came to the surface. I didn’t have him foul hooked, he was just big. I tried to get a couple of pictures of the large bull and then let him go. I went back and enjoyed more good fishing out of the same spot before moving down stream. My old marabou streamer and flashback stonefly were working great. Eventually I lost the flashback stonefly and tied on a different color of Pat’s Rubber legs. This one was also multi-colored but had a greenish-blue sparkly color. The fish seemed to like it better than the sparkly gold one that I had fished earlier in the day. At one good spot I caught a nice rainbow in the 14”-16” range that really stuck out for me. It was not the normal rainbow colors. It’s spots seemed bigger and more dominant to me. I am not sure if that means anything, but the fish simply did not look like most Wenaha rainbows that I catch. I finally turned around and headed back to camp just short of where Rock Creek and the Grizzly Ridge trail meet the main Wenaha. I had fished five miles downstream. That was a good distance to cover in a day of fishing. I usually only cover around three miles and I wondered to myself if that meant that I was getting more efficient at fishing as I got older or less patient. Either way it was a great day of fishing and I headed upstream back to my camp. The week prior I had spoken to a fellow hiker/fly fisherman by the name of Greg Topf. He had planned on hiking into the headwaters of the Minam River and floating/fishing his way out in an Alpacka Pack Raft. He had contacted my wife and I to shuttle him to the trailhead or his rig back to Minam. Flows did not cooperate though and he instead opted for a trip on the Wenaha. On my hike back to camp I spotted him scouting the river and we visited for a little bit before I headed on to camp and he presumably strung up his rod. I had until Monday evening to make it home and Sunday I thought I should float at least have the distance to Troy so I wouldn’t have too far to go on Monday. 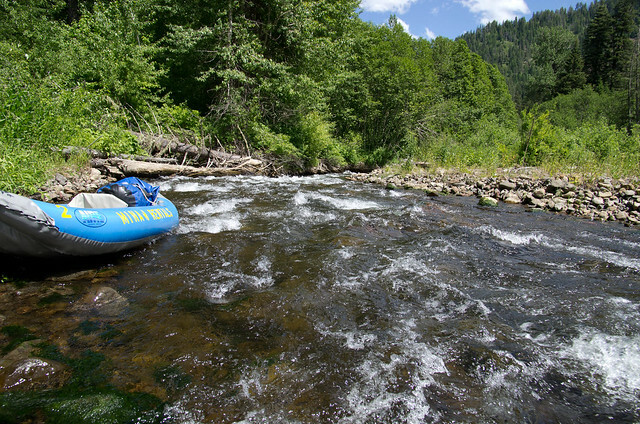 I packed up camp and headed down the river in the Aire inflatable kayak. Just below Greg’s Camp I spotted him fishing. I pulled over and we had a good visit. I took some pictures and after he was done fishing the slack water that I had caught the big bull out of the day prior I asked if he minded me fishing it. I could see another large bull in there and it was difficult to float on by without giving it another try. I caught several more nice fish, but none like the big one from the day before and Greg was nice enough to take some pictures as I caught fish out of his hole. From the Forks to Troy is about 21 miles and I thought I should cover at least have that distance if not a little more. Floating down stream I kept track of my pace and I was covering close to 5 miles an hour. The Wenaha is moving along at a good pace. It is not a relaxing float to say the least. There are not big rapids or anything like that at wadeable flows, but there are continuous rocks and obstacles. You are constantly maneuvering the kayak and I stopped and fished quite a few good spots on my way downstream just so I could have a break from paddling. Last year there was only one tree blocking the Wenaha when I floated. This year there were a lot more. It wasn’t bad like the South Fork of the Wenaha, but there was probably one tree blockage for every two miles of river. I reached Hoodoo by late afternoon and it was hot. If I haven’t mentioned it before, the Wenaha can get damn hot. The air that is, the water stays pretty cold for the most part. Last year as I was waiting for the sun to quit baking the Hoodoo trail so I could hike out, my thermometer read 97 degrees in the shade by the river. That’s hot. When I hike out of Hoodoo I usually wait until the sun begins to get low in the sky so there is shade on the trail, it makes a huge difference. There is good water both upstream and downstream of Hoodoo although I thought many of the bulls may have already moved upstream beyond this area for the summer. I set up camp and then fished downstream for a mile or so. I caught quite a few rainbows in the 8”-12” range, a few white fish, and one smallish 12” bull. It appeared I was probably right. I headed back to camp and found some shade to continue reading my book until the sun set and it was cool enough to sleep. Monday morning I was ready to get back to civilization. The canyon was hot even in the morning around Hoodoo and I was glad to get back on the water and get splashed. I saw the family of otters as I went downstream and was able to snap off a shot as I floated past and one of them poked its head out of the water. I was quite content with simply floating out. What fishing I had done upstream had been great and I felt no need to stop on the lower river to see what it was like. I did stop though, just to see how the fishing was in the lower canyon in summer. It was OK, not great. I caught numerous rainbows in the 8”-12” range and another white fish or two. 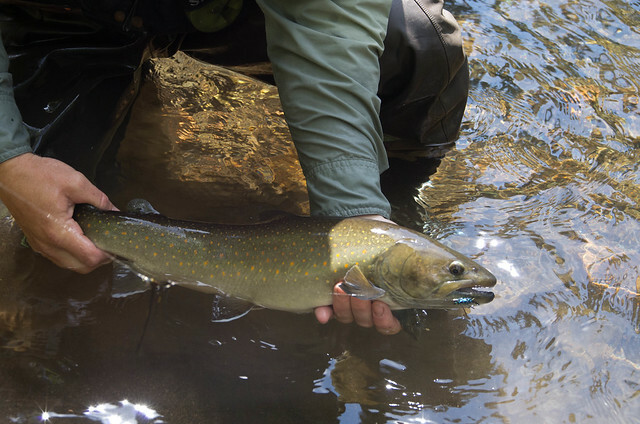 Most bull trout move higher up the system to colder water and to get nearer the spawning grounds for the fall. Floating over big pools can be quite fun. Big fish will first swim towards the tail out and then to the side as you float over them. 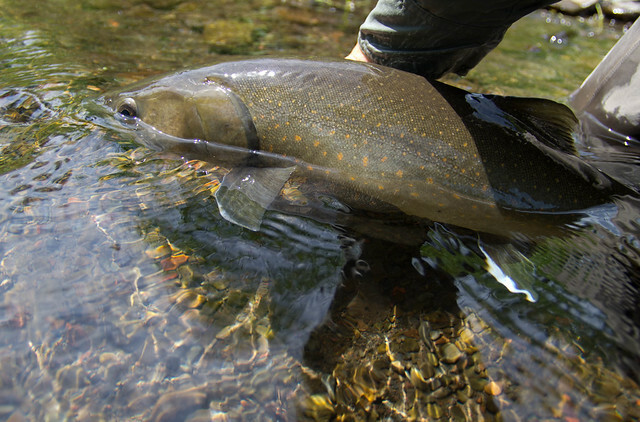 On the upper river I saw many big bull trout that tempted me to stop. I also saw a few Chinook and one scared the hell out of me. I had just stepped out of my kayak when something large began splashing in the water behind me. I didn’t know what it was but I jumped back into my kayak as I wheeled around to see what was after me. 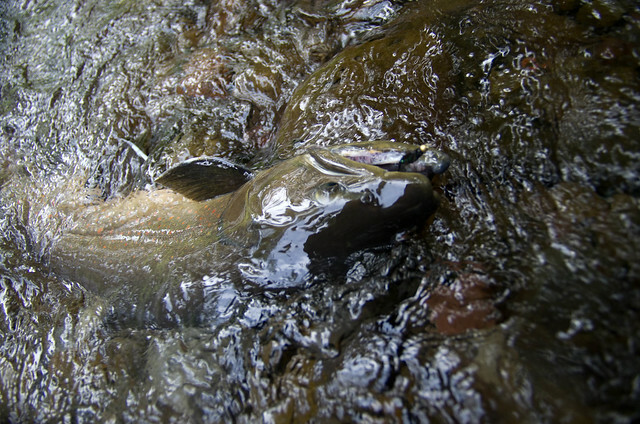 It was a large Chinook splashing its way through the shallow tail-out on its way upstream. I had a good laugh at myself and moved on. As I got closer to Troy I saw some fish that were not bulls, not Chinook, and not rainbows. They were most likely suckers. Floating the Wenaha is a fun way to see the river, but it is a lot of work. It is always a job to get your boat to the river and the paddling or rowing never ends once you are on the river. This year there are also quite a few more logs blocking the river as well. All were seen without too much trouble and were easily portaged. There are very few blind corners. One exception to that is a few miles down from the forks. There is a series of blown over trees with their root wads now half in the river and half in the air. They have been there for several years now and you cannot see what is coming on the other side of them. Right now there is only a very small path through around the corner, but I can see this spot becoming completely blocked pretty easily. The bank on the right is eroding and there is another large tree that will fall in this section within a year or two. Whenever you can’t see, scout and be safe. If you decide to float the Wenaha our shuttle business does do shuttles for hikers as well as boaters. Nice to read your post! I am reading the same book but only about 1/3 thru. Question, how big are your streamers? Hook size? Do you use any weighted flies for faster or deeper pools. I have been fishing the Will. Valley rivers for Summers, but my new Spey Rod has had a long learning curve, first in casting, and second in the hook-set or playing. The rod has so much power compared to a single-handed rod, no summers to hand yet but have caught several nice native rainbows. Hope you have a great summer, sounds like it started off well. Thanks! I have been tying my streamers on a size 6 2x or 3x long, extra heavy hook. Something like a Tiemco 5262. I use to tie them bigger, but a size 6 is plenty big and I can roll cast a size 6 farther than a 2 or 4. I weight all my streamers and most of my nymphs. Most of the water on the Wenaha is fast and tumultuous before it dumps into a relatively short, deep run or pool. It takes weight to fish this kind of water effectively. So as I said before I weight my flies and then am not afraid to throw a couple of split shot on if needed. 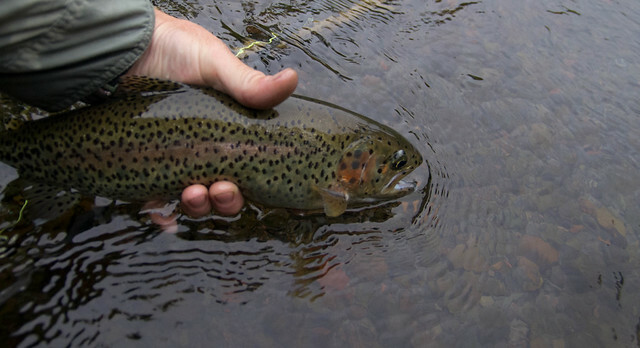 Longer or slower water would not require near as much weight as your flies will have more time to get down. When fishing water that is shallower or slower I will sometimes put a thing-a-ma-bobber on to keep the flies up off the bottom. A bobber is also useful for fishing difficult currents. The bobber can give a good anchor point to do some serious mending so that you don’t lift your flies up and out of the water you are trying to fish. Hope that helps.